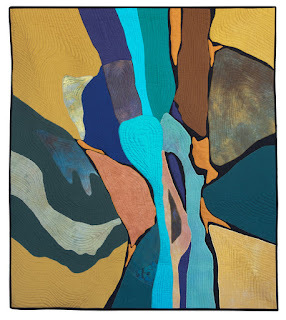 "View From Above #3"; textile, 44 x 39, has been juried in Filoli Gallery's exhibit, "Heart of the Valleys Delight". This exhibit is about artworks that represent Silicon Valley and its history. As you know the valley was agricultural at one time and you can still see evidence of this if you know where to look. Filoli, is located in Woodside, California and is a wonderful representation of agricultural delight itself! Exhibit runs from August 23 - October 23, 2016. The artwork is for sale; if interested please contact me. Closing reception is October 20, 2016 5-7 PM.